Fig. 1. 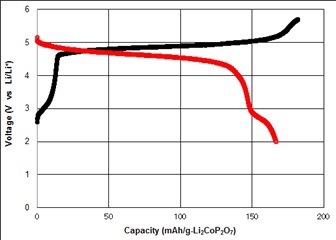 Charge/discharge curves of the new cathode material Black line: charge curve. Red line: discharge curve. The new material can operate at charge/discharge voltages of over 5V, which is beyond the limits of conventional lithium secondary batteries. FDK Corporation and Fujitsu Laboratories today announced that they have jointly developed lithium cobalt pyrophosphate (Li2CoP2O7), which has high energy density, for the cathode material of all-solid lithium-ion batteries (“all-solid-state batteries”). This material enables the development of all-solid-state batteries with higher voltage and higher capacity. In recent years, the specifications required for batteries are becoming increasingly diverse, and, in particular, there is increasing interest in high energy density and safety performance. 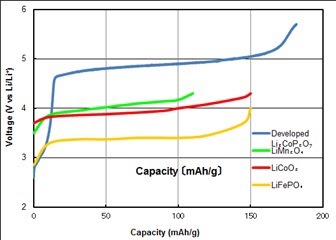 While there is active progress on improving lithium-ion and other existing batteries, development work is advancing on various types of next-generation batteries with the potential to exceed the performance of existing batteries, and all-solid-state batteries are attracting attention as next-generation batteries with superior safety performance. FDK is working on the development of all-solid-state batteries, with such characteristics as high energy density, superior safety performance, and long battery life. The energy of a battery is a function of its voltage and capacity, and the development of an electrode material with high voltage and high capacity is required to create a battery with high energy density. In the process of developing an all-solid-state battery, through the use of FDK’s Computer Aided Engineering (CAE) technology and Fujitsu Laboratories’ materials formation technologies, FDK and Fujitsu Laboratories succeeded in developing the cathode material lithium cobalt pyrophosphate (Li2CoP2O7) for all-solid-state batteries. The material has approximately1.5 times the energy density of existing cathode materials for lithium-ion batteries. Through computational physics, FDK and Fujitsu Laboratories have found that this material, when applied to all-solid-state batteries, is capable of operating with twice the energy density of existing cathode materials used in lithium-ion batteries. While working to further raise the performance of this material, the companies will continue development with the aim of an early market launch of a compact and safe all-solid-state battery that can be used in IoT applications, wearables, and mobile devices. This material and technology will be exhibited at the FDK booth during BATTERY JAPAN 2017 (8th international rechargeable battery expo) being held from March 1 to 3, 2017, at Tokyo Big Sight. This entry was posted in Nanotechnology and tagged Batteries, Energy storage, Nanotechnology.